I have had almost 2-0 British high command figures on my painting desk for over 6 months; they have been getting a little attention here and there as I had the time, and I took advantage of some recent New England "snow days" to finally finish them! This is a group of seven 28mm command figures from Old Glory; their British General;s set plus one of the officers from their RHA set, who will serve as a British Artillery commander if needed. Here's the first one - "are those Prussian or French I see coming?" He is wearing a pretty standard British generals's uniform with white pants. Some of the dark red shading on the jacket doesn't show up too well here. I might consider black lining the crimson sash - the universal mark of a British army officer. as he prepares to hand off some orders to an unseen ADC . The gold cords on the right shoulder became a mark of a British General in the later part of the Napoleonic Wars. Here's the lone Cavalry general of the set. His dress is clearly inspired by that worn by Uxbridge at Waterloo. - right down to the leopard skin saddle blanket! "Orders?! My Lord Soggybottom should presume to send ME Orders? Harrumph!" The dark blue saddle blanket with gold trim was standard issue for higher officers, apparently without any royal monograms or similar frippery! The General's horses were painted en masse about 6 months ago, using staining and washing techniques. The standard British officer's coat was bright red with dark blue cuffs, collars, and lapels, with gold ornamentation. Turnbacks on the coat were white. The short plume was UK standard white over red. No gold lace on the bicorn, though! Classic "General with telescope" pose for this fellow - I should add a spot of light blue to the end of the scope for the lens! He again wears the regulation uniform for a British General. "I say, Smithers, is that the Gin wagon approaching?" The pelisse was worn by some RHA officers with a higher fashion sense! Quite a dapper looking officer, especially for the Artillery! The second part of this series will be some Foundy command figures form their last big sale a year or so ago! Lancashire Games has a 15% off sale until the end of this month (January); I took advantage of the sale and placed an order on January 9th; the first half of the order arrived 1/`19, and the seciond half yesterday; excellent turn around time. the sale applies to pretty much everything. With the discount, a pack of 4 28mm Infantry is $5.42, about $1.35 a figure. However, if you order them in battle Packs of 16 (includes command figures), a pack on sale is $20.84. about $1.30 a figure. But wait, there's more... if you order 4 or more Battle Packs the price (on sale) drops even further to $18.06 a pack or about $1.13 a figure. The bad news is the overseas shipping - at 40% that's a real OUCH, but the multiple discounts above keep the price within reason. You don't see much discussion of their ranges, and the pictures on their website are fairly poor, so I thought I'd post some pictures of the figures I received "in the raw" as it were, before they are even primed. There was a modest amount of flash on almost every figure, but that was easily removed. the size of the figures is similar to Old Glory 25's, I'd say, just a bit chunkier. All packs have a mix of poses. I ordered a total of six battle packs - 4 of Prussian Landwehr and two of Prussian Grenadiers (wearing their tall plumes - yay, one of my motivations for ordering from this manufacturer in the first place! ), plus 2 Prussian Generals and a few single packs to fit my organizational needs. Although the storm Tuesday was much less than expected here in Western CT, it still kept us in all day, so I put the time to use prepping the figures and getting them ready for priming. Now I just need it to warm up to at least 30 degrees so that I can prime them in my garage! If I do that after the cars have been out and returned, the engine heat warms the attached garage up into the 50'/s. First up an 18 figure unit of Landwehr. I culled all the "Advancing" loses from the 4 BP's plus, so this outfit will have pretty uniform poses, with a few men lacking hats. Another view. I glue my figures to tongue depressors before priming and painting. I reuse them (ick, not after examinations, but with multiple crops of figures) many times before discarding the old ones for new sticks. The green blotches of paint indicate that this will be a Westphalian Landwehr battalion, with green facings. Here's the second unit of Landwehr; this one has the men in a "firing" position. I know some swargamers don't like this position due to tabletop and storage issues, but I like some of my infantry in firing poses. I actually ordered my extra Landwehr figures in "Firing poses", which worked out well. Another view of the 2nd unit; the yellow splotches indicate this will be a Silesian outfit, with yellow facings. The third unit is again in a fairly uniform "advancing" pose. The standard bearer is cast open handed and will need a Florist's wire flagpole added before priming. The light Blue splotches indicate an Elbe unit, with Light blue facings. The figures have nice details in the folds of the Litewkas and pants, which should make painting them easy. They also have a nice raised Landwehrkreuz at the front of their Schirmutze caps. Here's the final Landwehr unit; this one had dark red splotches (Madder or Crab Red), indicating a "Rhein" department unit. This unit has a cacophony of poses... perhaps appropriate for a very raw unit. The Litewkas of these figures vary in length considerably, just as they did in real life. Now we move on to the Grenadiers. Without their plumes, it is almost impossible to tell tell the Grenaiders from the Prussian Line infantry. Lancashire is the only manufacturer I know of who currently makes 28MM Prussian Grenadiers with their tall plumes; thanks to my friend Steve in Australia for pointing them out to me a few years ago! The orange-red splotches indicates these Grenadiers will be part of an East Prussian unit. The second Grenadier unit has a bit more variety of poses. No splotyches indicates this will be a Pomeranian unit (white facings). The Grenadier Standard Bearers are cast with alloy flagpoles; I will probably cut them off and replace with wire. The final unit is in predominantly firing poses; the first 4 stands will form a smaller unit, and the extra command stand will be be used to bring an exiting (Minifigs) Grenadier Battalion up to 4 stands. The yellow splotches again indicate a Silesian outfit. A pair of Prussian Generals by Lancashire Games. The other objects are finials with cords for the standard bearers; once again these will probably work better with wire flagpoles. I may or may not use them. "Mein lieber General, bestellen Sie einige Zinnfiguren heute, vor dem Verkauf endet! 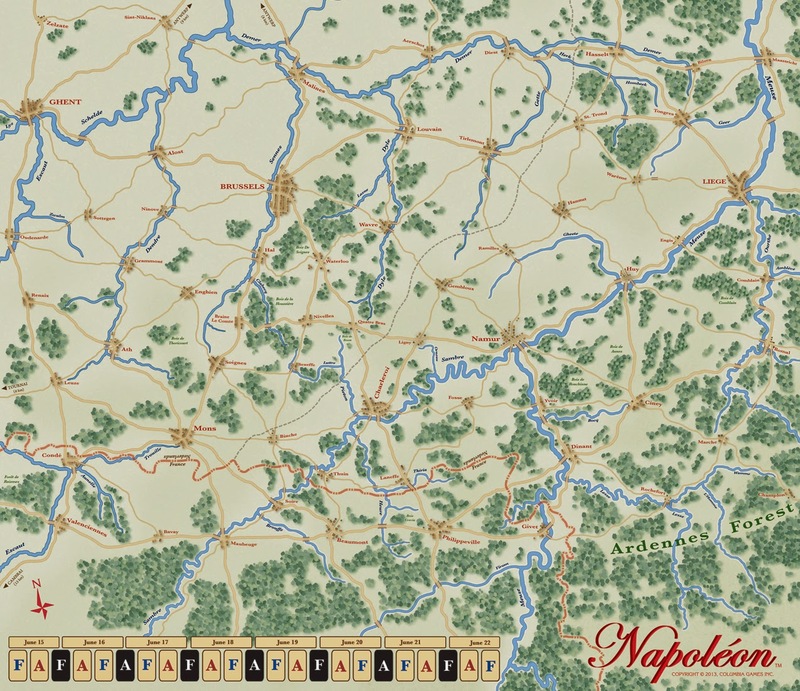 We of the Hartford Area Historical Gaming Society are working out the details for our upcoming "Campaign in a Day" to be held Sunday April 26, 2015, using the Snappy Nappy rules by Russ Lockwood. We had a great time with our prior events, the first based upon the events of April 1809, and the second based upon August 1813. This one will depict the events of June, 2015. See the flyer below for the details of the event, which is open to all interested parties. I highly recommend the unique "Fog of War" experience of these events! The event will be held at The Portal gaming space in Manchester, Connecticut. The Portal is directly across the street from its parent store, The Time Machine. It is superb gaming space, and ideal for this project. There is excellent lighting and a large number of 4 x 6 foot gaming tables available, most of which will be in use for this project. It worked very well for our 1813 event! At present, the plan is to "Zoom in" one level, so that a stand of Infantry represents 1000 men, a stand of Cavalry represents 400 men, and a stand of Artillery represents 12 guns with crews. Infantry and cavalry units generally have 2 stands per unit, while Artillery units have one stand only. At that level, the game could easily handle up to 16 players. Alternatively, if turnout is light, the forces can easily be cut in half, which would put it back at the base ratios for Snappy Nappy. 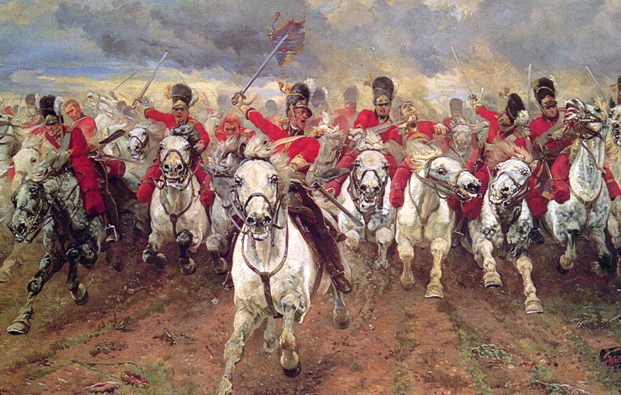 Although perhaps the most famous British unit of the Napoleonic Wars, the 95th was also one of the youngest. It derived form the Experimental Corps of Riflemen, formed in 1800, which became the 95th (Rifle) regiment of Foot in 1803. The 95th trained in light infantry tactics along with other two other new Light Infantry regiments in 1803. A second battalion was raised in 1805, and a third in 1809. All three battalions served in the Peninsula and elsewhere during the Napoleonic Wars. The 95th was renamed the Rifle Brigade in 1816. The 95th (Rifle) regiment. Picking off officers of French units on a tabletop near you! Old Glory 28mm figures. A is often the case, the green is darker on the figures than it appears in the pictures. The Baker Rifle was said to be able to hit a man sized target at 200 years, and as far as 400 years in the hands of an expert marksman. Many of the riflemen were taught to read and write, which may account for the unusually large number of memoirs penned by enlisted men of the Regiment. Those in turn may also partially explain some of the fame of the regiment as it pertains to the Napoleonic Wars! Similarly, there are an unusually large number of re-enactor/living history units inspired by the 95th, including outfits in the UK, the USA, and Australia. Of the several new books acquired over the Holidays, I was most eager to read this one. It was finally published in November, almost a year late, as a result of a life threatening illness by the chief author, John Carr. This side tale, set in the Paratime world of Lord Kalvan of Otherwhen (Aryan Transpacific, Styphon's Houie subsector), which has roughly 30 Years War level military technology, is unique in that Kalvan makes almost no appearance whatsoever in its pages, although he continues to have a strong direct and indirect influence on events. The novel is set after the events related in the Sequel, "Kalvan Kingmaker", and immediately before those of "The Siege of Tarr-Hostigos". It chronicles the events in the Kingdom of Bletha set in motion by King Kalvan of Hos-Hostigos sending his "Chief of Intelligence", the former horse thief Duke Skanga, and a promising but somewhat hot headed Colonel from the Royal Army, Democriphon, to Hos-Bletha to uinitiate a 5th column action designed to tie up the armed forces of Hos-Bletha so that the Kingdom will not be able to send its planned contribution to join the Grand Host of Styphon, being gathered to crush Kalvan once and for all. Starting with a small band of leaders and a few companies of soldiers, the activities of Kalvan's agents range from raids to con games to Robin Hood inspired woodland outlaws, to systematically plundering the corrupt temples of Styphon and using the gold gained to fund operations. Along the way some old secrets are uncovered that further destabilize the regime of Great King Niclophon. I don't want to give away any of the many plot tuns in the book so I'll merely say that I thoroughly enjoyed this book. While it lacks much in the way of battles that one might want to bring to the tabletop, there is plenty of fighting. This book was blast to read, and perhaps the closest in tone and style to the original Lord Kalvan of any of the sequels. I tore through its 650+ pages in less than a week! Highly recommended. At present The Hos Blethan Affair is available only in the beautifully produced but expensive limited edition hardcover book form; all of John's other works are now available in reasonably priced kindle/epub forms, either direct from John or via Amazon. John's site even has the 1st edition version of Great King's War (the first sequel to the original Lord Kalvan of Otherwhen by H. Beam Piper) available for free download. The origins of this regiment date back to 1756, when it was raised as the 62nd Regiment (Royal Americans) in four battalions from American colonists and officered largely by foreigners (mostly German) of Protestant faith - the first time a British regiment had non-British officers. The regiment was re-numbered as the 60th Regiment in 1757. It fought at Louisborg and Quebec. In 1797, a 5th battalion was raised on the Isles of Wight, primarily from Germans, and was equipped entirely with rifles - the first Rifle armed Regular battalion in the British army. It was also the first Regular unit to wear a green uniform (with red facings). A 6th battalion was raised in 1799; The 5th battalion saw extensive service in the Peninsula. The Light companies of the Line battalions of the 60th were later armed with Rifles as well. A 7th Battalion, again rifle armed, was raised in 1813 for service in the Americas during the War of 1812. Later in 1815 the Regiment's name was changed to the Duke of York's Own Rifle Corps, and then again in 18130 to The King's Royal Rifle Corps. The 5th (Rifle) battalion of the regiment wore dark blue pants with red stripes down the outer seams - quite unique in the British infantry. Battle Honors awarded to the 5th battalion include "Rolica" "Vimiera" "Talavera" "Busaco" "Fuentes d'Onor" "Albuhera" "Ciudad Rodrigo" "Badajoz" "Salamanca" "Vittoria" "Pyrenees" "Nivelle" "Nive" "Orthes" "Toulouse" and "Peninsula"
The motto of the Regiment is Celer et Audax (Swift and Bold). It is said to have been conferred by Major-General James Wolfe. Apparently, Wolfe was was greatly impressed with the alertness, intrepidity and spirited conduct of the grenadier companies of the 2nd and 3rd Battalion of the 60th Royal Americans before Quebec that he conferred it upon them. Curiously, it seems to have been forgotten later, and only officially restored to the Regiment in 1824! The 5th Battalion fought mostly in 1-2 company detachments dispersed among the Peninsular army to bolster its skirmishing capabilities. 28mm Old Glory figures.